With many delightful courses, pure coastal breeze from the Atlantic ocean, great fresh gastronomy and fantastic weather conditions, the Lisbon is a Golf Bliss for most golfers. This fascinating and very endearing city was made by the official capital of the Kingdom of Portugal in 1256 although it had been in the Christian hands since 1147 when Afonso Henriques liberated the town from the Moors. Even today the foundations of Roman buildings are being discovered pointing to its early importance when it was given the name of "Felicitas Julia Olissipo". From physical evidence it is certain that the location has been inhabited from the Bronze Age, Tartessus, Celts, Phoenicians, Romans, Visigoths and Moors. Like most other capitals in Europe, Lisbon has its own individual character influenced and moulded by its own history and its inhabitants. (For the purpose of this brief description historical factors have mainly been left to the many good available guidebooks). 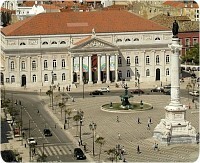 Lisbon has in its existence recorded several serious earthquakes, one in 1505 and a second in 1512. However, due to the very destructive earthquake in 1755 the centre of this city was virtually completely destroyed. The King gave the then powerful Marquês do Pombal the opportunity to create his radical and impressive layout of streets. The idea of wide avenues and streets was a complete change to the narrow and haphazard ones that abounded in all major cities of that time. Although this conception today may seem normal and is found in most of the capitals of Europe, the concept was very impressive for that time. The number of inhabitants of Lisbon is over 664.000. This section of Lisbon was the pride of Pombal and the very heart of his own great city. The streets are named appropriately as the homes of banking and trade, with names such as Rua do Ouro (gold), Rua da Prata (silver), Rua dos Sapateiros (shoemakers), and Praça do Comércio (trading), each one appropriately indicating its purposes. Today, many institutions by necessity have since moved and expanded to other sections of the city but this area still maintains a past dignity and hum of trading. Certain activities have stayed in their historic buildings, such as the fish market at Cais de Sodré that still portrays its strong character with the traditional bustle of the disappearing "varinas" busy in the streets with baskets of fresh fish skilfully balanced on their heads. 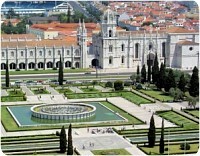 From an architectural point of view places to view are the squares of Praça do Comércio and the Rossio. Also of interest is the church of Conceição Velha, the Sé (Cathedral), and the 16th Century Casa dos Bicos. This is the oldest surviving area of the city and lies under the walls of the Castle of São Jorge stretching down to the Baixa. A muddle of very narrow streets and small squares help to create for the visitor a glimpse of a forgotten age, especially taking in the old Moorish quarter known as Mouraria. Today, it is still a residential area and at night time an area with taverns for typical food and the special Portuguese music of "Fado". There are several places of interest among which is the Fundação do Espírito Santo (Museum of Workshop of Decorative Art). 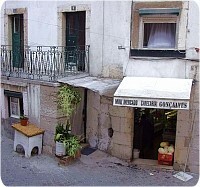 The medieval quarter of Santa Cruz, and certain old very narrow streets, Rua de São Miguel, Rua de São Pedro and Largo do Chafariz de Dentro. Every morning on Tuesdays and Saturdays on the outskirts of Alfama, at the Campo de Santa Clara, there is a fascinating "flea market" known as the "Feira da Ladra" and very worthy of a visit. Within close distance of this twice weekly event there are the churches of Santa Engracia and São Vicente de Fora. This area which is located on the opposite hill from the Alfama and is linked with to the Baixa by a fashionable shopping street named Chiado. A visitor will find here some of Lisbon’s select society shops selling internationally famous brand names alongside national products. The Chiado has its own special local cafes that act as popular meeting places for writers and artists. A interesting way to reach the Bairro Alto from the Baixa is to use the "Elevador de Santa Justa" designed and built by the French architect "Eiffel". Another way is to use one of the two "funicular-like" trams - each an interesting experience! 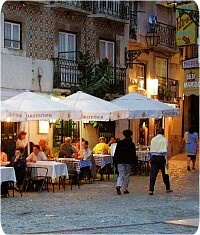 The Bairro Alto was originally developed in the 16th Century as a residential quarter for traders. 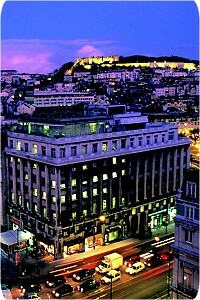 Now it has become a centre for nightlife with its many fashionable restaurants, bars and clubs. An impressive ruin caused by the earthquake of 1755 is the 14th Century Igreja de Carmo, and the chapel that withstood the destruction has been turned into an Archaeological Museum. The unimpressive façade of the 16th Century church of São Roque hides within an impressive 18th Century chapel that was commissioned by King João V from Italian architects and pre-constructed in Rome prior to being shipped to Portugal. Scattered through the city are many interesting places and buildings. Amongst these are the Igreja da Estrela and its generous gardens, the English Cemetery that contains some historic names, Parque Eduardo VII, the Estufas (huge and wonderful greenhouses), and the Jardim Zoológico. An area that must not be missed is Belém. Located to the west side of the city this area runs along the River Tejo. 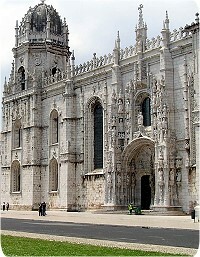 Here can be found the baroque elegance of the Mosteiro dos Jerónimos that was commenced in 1501 by the order of King Manuel I to celebrate the naval discovery of India. As a contrasting statement to the historical monuments is the modern architecture of the Centro Cultural de Belém that stands firmly between this historic Monastery and the striking baroque style 16th Century Torre de Belém built from 1515. On the river close to this point is also the famous work named Padrão dos Descobrimentos and erected in 1960 to celebrate the 500th anniversary of the birth of Portugal’s famous "Prince Henry the Navigator". To the west of the centre of the city is the prominent sight of the Aqueduct das Águas Livres that was constructed in the first half of the 18th Century. It has 35 arches and is 941 meters long and to this day its purpose is still to bring water to the inhabitants of Lisboa.